Are the Mavic Pro and the Platinum batteries identical except for color? After ordering my Platinum package (which appeared via the page picture to include a second battery) I ordered what I thought would be a third battery (regular Mavic Pro), which arrived and I charged it. My Platinum package arrived today (!!!!!!!!!!! ), but it only contains the one Platinum battery. I&apos;d like to order that THIRD battery, but the Platinum battery costs more than twice as much as the standard Pro battery (ie, like the second one I ordered and charged). I don&apos;t care about matching the color to the A/C, as long as the performance is the same. Da Noob, about to disappear down a rabbit hole for a time. I have all the dji apps (Asst 2, GO 4) and await the Mini 4 so I can set that up. I am assuming that I&apos;ll want to install both of the standard batteries in the A/C when updating in order to maintain consistency? Thanks for GO 4 link. I have been all through that. And thanks for the reply on the battery compatibility. I assumed so, but wanted to make sure. Hello Eddie, yes, the Mavic Pro battery is compatible with the Platinum. You can find the answer in the Platinum FAQ: https://www.dji.com/mavic-pro-platinum/info#faq Feel free to contact us if you have any other questions. 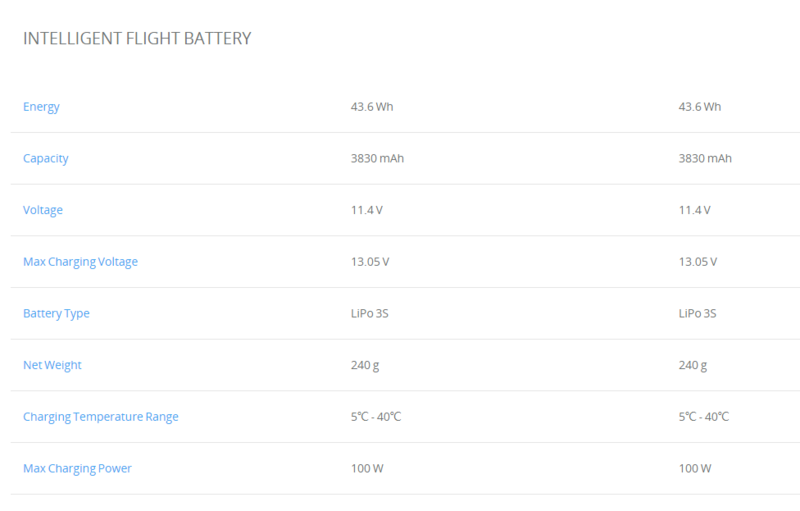 So, there is no difference regarding capacity or performance between Mavic Pro and Platinum battery, right? Why by the Standard Pro Battery, if the matching Platinum battery costs the same? If not, try another vendor that doesn&apos;t screw their customers. Yes, that&apos;s right. There will be no difference when it comes to the Mavic Pro and Mavic Pro Platinum batteries. For reference, please see the attached image below. You may also check or compare the details of each drone to our website. Just go to www.dji.com. >> Click the Consumer on the top left corner >> then click consumer drone&apos;s comparison. If you have further question, please let us know. Thanks! Thank you for your reply Natalia. Dear Sir Please help. I bought a Mavic Pro Platinum as a gift but the second time they used it it splashed in the seawater and now has water damage. I cannot afford to repair it (€900) so I wondered if I can use the batteries on another cheaper drone, either from dji or a competitor? It seems an awful waste of money. I have a drone and 3 batteries I cannot use, after a large outlay of cost. Please help. I had an unexpected fly away yesterday with my Dji Mavic Pro not sure if it was interference or what but the darn thing landed in the Ocean, go figure of all places which was un retrievable. Whats sad is I did not have my Getterback which is a recovery system for drones, link for that is below as well and course I did not have mine on yesterday ir I would have had a great chance on getting it back buy what are ya going to do? NADA.... I still have 2 Mavic Pro batteries and I was thinking about going today to best buy and buy the DJI - Mavic Pro but they are no longer on sale for $879.00 which is what i PAID FOR at BestBuy a few weeks ago. What DJI did, is they lowered the price if the Dji Mavic Pro Platinum Quadcopter with Remote Controller to $999.99 WHICH IS A KILLER DEAL!! I am most likely going to go with the Dji Platinum since they are both the same price now from the Dji Official store. BestBuy jacked up the Mavic Pro to $1200 for Xmas or i WOULD gotten the same tthe same drone. What would you do if you were me? Go buy the Dji Mavic Pro from Dji for 999.00 or go with the Mavic Pro - Platinum Quadcopter SERIES instead for $999 from bestbuy?? i JUST WANDER IF the batteries for the Mavic pro will fit in the Mavic Pro - Platinum ?? If you do any flying over water, I would high recommend installing of these on your drone for easy recovery.